Zone of cold hardiness refers to the plant’s ability to survive the winter. It plays a key factor in selecting landscape plants for the region. USDA has classified the entire United States into 13 plant hardiness zones based on their average, annual minimum temperature during 30 year period. Zones with lower number indicate colder climate and the higher number indicate warmer climate. Each hardiness zones differ by 10 degree F and are further divided in to two sub zones that differ by 5 degree F. The colder half of the sub zone is indicated by the letter ‘a’ and the warmer half indicated by the letter ‘b’. 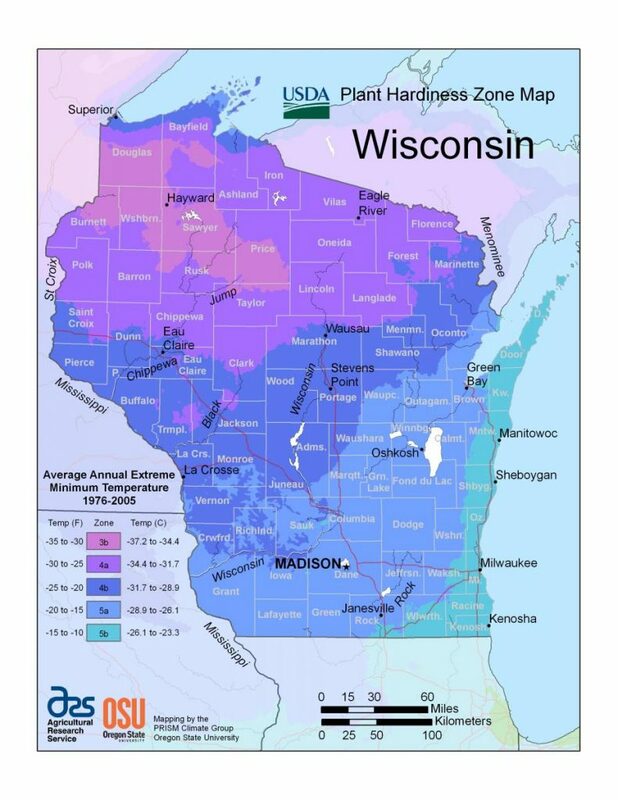 Wisconsin has three cold hardiness zones – Zone 3 (Northwestern WI), Zone 4 (North, Central, Western WI) and Zone 5 (Southern and eastern WI up past Green Bay and Apostle Islands).